Discussion in 'iOS 7' started by CosmoPilot, Jun 11, 2013. I guess everyone now knows what polarizing means. Usually Apple keynotes bring out haters...but this is on a new level. I then watched every video on YouTube and compared iOS6 icons against the new iOS7 icons. And to be completely honest, I'm getting more and more excited as each moment passes. For those complaining about the "unbalance" of all the icons, I'd really like to see what their current home screens look like. I mean if you only have Apple apps on your iPhone, then I apologize in advance, but I bet they have 3rd party apps on their home screens...so unbalanced...really? Is this an issue? This time next year, all the whining and complaining will be a distant memory. It will take the average user a week or two (tops) to get used to the new design and forget about iOS6 and all previous versions will feel dated. This time next year, all the whining and complaining will be a distant memory. I think they misspoke, actually. They said "polarizing" but they meant to say "polarized." The thing is with the icons is they are actually distinguishable from each other quickly, I like that. I'm not sure I'd want them too consistent, I think people are missing the point there. I personally love iOS 7 so far. I love, love, LOVE iOS7. The effects are awesome and make you dive into it. I can't wait till they release the next beta and make it smoother and faster. For those complaining about the "unbalance" of all the icons, I'd really like to see what their current home screens look like. I am very happy with the feature changes to iOS 7, but I absolutely hate many of the new icons. I always keep my first home screen default, switching only Newsstand for iBooks (which are both wood so they swap without unbalancing the look) and stocks for contacts (a year later it still bothers me I had to do this, the blue looks so good here). In fact, from iOS 2 through 5, I kept my home screen completely stock. My other screens are carefully arranged by colour and how often an app is used, which is silly, but I am an artist and it gives me pleasure. I don't hate iOS 7, I would just like a little more care put into the icons, which Apple usually doesn't have an issue with. I do approve of the font choice. Love ultralight. While I don't disagree with you for the most part. Just want it said, that this is the first iOS update I have had any issue with. I am usually ecstatic and I expect to be delighted again with iOS 8. This is iOS 6, right? Yep. Just liked the new background. I'd bet that you'd be in the minority there. The fact is everyone uses different apps. I don't use stocks, or the default iOS calculator so those are tucked into folders. My home screen is mainly folders actually. I also have 136 third party apps installed. All of them have different style icons. 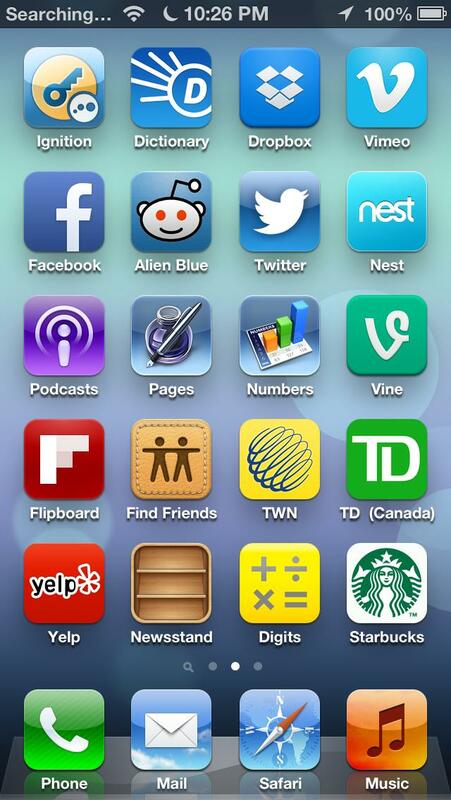 People have tons of apps and developers arn't going to all decide on a uniform style to match the stock Apple apps. I don't think it really matters that much if the stock app icons are slightly different styles when they are all mixed together with the rest of the apps. I don't think it really matters that much if the stock app icons are slightly different styles when they are all mixed together with the rest of the apps. I agree I am in the minority. I rarely see anyone with a default home screen. I am not too concerned with the mixing of Apple's flat icons and the icons of other apps. I simply believe the design of some of the new icons is poorer than I expect from Apple. I personally find Notes, Reminders, Newsstand, and Safari hideous. I don't understand why the camera icon was changed to show a traditional camera, I thought we were moving away from dedicated cameras. It reminds me of using a floppy disk icon to signify save. The colours in maps icon look unbalanced. I kinda like the photos icon, but have no idea why they are using a colour wheel to represent photos; I believe there are better options. Game Center's bubbled are just baffling. I also miss the orange for Music and find the green of Messages and Phone blinding. But this is all my opinion, I could be wrong. I just went to Apple's website again and re-watched the iOS7 video and went through all the features pages again. Don't know if it's me or not, but this thing is really growing on me. I just noticed the keyboard is translucent as well. Very subtle, but a nice touch providing a sense of depth. I really think Apple has a winner here! Remember, I was slightly disappointed with the home screen after watching the keynote. After spending 20 to 30 minutes on Apple's website and then launching iOS6 on my iP5, I thought, "Wow, my UI feels dated!" Just wait until you try it. It feels so fresh. There is a big emphasis on layers. Opening apps zoom in towards the icon and there are lots of transparencies (folders, control centre, notification centre, etc). Even the keypad on the phone app shows the your wallpaper in the thin circles around the numbers. It all flows together really nicely and shows Apple's attention to detail. It will take the average user a week or two (tops) to get used to the new design and forget about iOS6 and all previous versions will feel dated. It took me less than 24 hours. I guess I'm lowering the average And I can't wait for third party apps to be updated for iOS 7 (for example for whatsapp to get a look closer to the stock messages app and the translucent keyboard).